Assam Chief Minister Sarbananda Sonowal on Monday urged IPS probationers of 2017 batch, who are on a study tour to Assam, to serve the nation with integrity and commitment. He also asked them to contribute in the nation building exercise with compassion and responsiveness to the poor and downtrodden. Interacting with the IPS probationers at his conference room at Janata Bhawan, Chief Minister Sonowal said the young officers shoulder great responsibility in ensuring good governance and bringing transparency as well as accountability into the administrative system. The uniform that they wear must be used to protect and uphold the interest of the hapless so that it instils trust and confidence amongst them on the government machinery, Sonowal emphasised. During the interaction, the Chief Minister highlighted the rich legacy, culture and resources of the state. He said Assam is a mini India where people display great sense of social harmony. Informing them about the contributions of Mahapurush Shrimanta Shankardev in building the cultural, social and spiritual edifice of the Assamese society, he said the state is known for its secularism and tolerance. He further said the state government is working to reinforce the lofty ideals of peace and harmony amongst all sections of the society and unleash equitable development following Prime Minister Narendra Modi’s vision of sabka saath, sabka vikas. 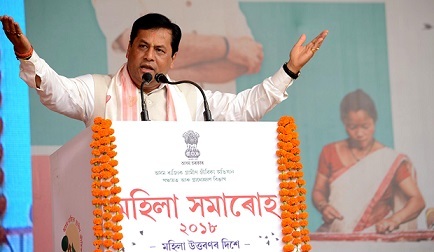 Sonowal also underlined the economic potential of the state to emerge as the gateway to the Southeast Asia and the initiatives being adopted to transform the growth narrative of the state through implementation of Act East Policy. He also spoke about the drives being undertaken to root out corruption in the state and the thrust being given by the union government to bring about a paradigm shift in the growth trajectory of the state. The probationer IPS officers thanked the Chief Minister for the interaction programme and shared their experiences from the three-day visit to Assam. The probationers are presently undergoing training at the Sardar Ballav Bhai Patel National Police Academy in Hyderabad and they have visited Assam after completing their tour to Mizoram. During their fifteen-day tour to Northeast, the officers would also visit Meghalaya.